With the recent announcement of the new Spider-Man Event called “Spider-Verse” it got us thinking; how long will it take us to compile a list together for our fans. Well it took a little while, but it was well worth it. In case you’re out of the loop a little bit, Spider-Verse will bring together every single different form of the Spider-Man character ever in a Spidey event series. Sounds like fun! For fans alike, this should be an absolute thrill ride. The readers will be in eye candy heaven. So what does this mean exactly for the speculator? Well they too will have a joy ride ahead of them. The math is not hard on this one at all. Here is how it will probably go down. Spider-Verse will release and there will be a mad frenzy for many of the Spidey characters. Be it in a suit/Spidey-Armour/power or anything for that matter. Marvel will get wind of the public outcry for say…..the Iron Spider-Man (one of our personal favorites) and they will respond. Bottom line folks, expect some branching out of the Spider-Man Universe for years to come. Be on top of some of the ridiculous ones and the stellar ones before you’re caught without a copy of that NEW popular Spidey character with their own series. Amazing Fantasy #15 (1962) – First original Spidey costume. Amazing Spider-Man #529 – The first Iron-Spider-Man suit. This Bryan Hitch cover really pops. The cover shows the suit in its full glory. Amazing Spider-Man #252 (1984) – The first black suit Spider-Man. Need any more than this? Amazing Spider-Man #365 (1992) – Spider-Man 2099 (first appearance) is already making his presence felt in the pages of Spider-Man. Who knows how big 2099 will get eventually…..again. Web of Spider-Man #70 (1990) – The very first appearance of Spider-Hulk. Spider-Man 2099 Meets Spider-Man – This graphic novel soft cover features the first Spider-Man 2211. Web of Spider-Man #117 (1994) – First Ben Reilly as Scarlett Spider. Spider-Man #21 (1992) – With Deathlok heating up the small screen these days, how about a cyborg Spider-Man? Check out the awesome Erik Larsen cover too! Your first look at Cyber-Spider. Amazing Spider-Man #329 (1990) – Can you imagine the coolness of having a Captain Universe Spider-Man running around the Marvel cosmic books? Maybe this would be a way for Marvel to sneak in Spider-Man into the Marvel Studio movies. Check out when Spidey goes power cosmic for the first time right here. Erik Larsen at the helm once again. Peter Parker, The Spectacular Spider-Man #39 (1980) – Spider-Lizard makes his debut here. Webspinner’s: Tales of Spider-Man #13 (2000) – The official/unofficial first Spider-Man Unlimited. Web of Spider-Man #100 (1993) – The first Spider-Armor. Spider-Man #90 (1998) – First Negative Zone Spidey. Universe X: Spidey #1 (2000) – Spiders-Man first appearance. That’s some stretch with the name right? Must have been an all-nighter trying to come up with that name. Peter Parker The Spectacular Spider-Man #66 (1982) – Spidey is having all sorts of issues with Electro in this comic. So he builds an Electro suit. Amazing Spider-Man #100 (1971) – Spidey with six arms! Classic Spidey cover and Gil Kane pencils. Spider-Man #58 (1995) – First appearance of Black Scarlet Spider. Funeral For An Octopus #2 (1995) – Spider-Man as Octo-Spider-Man! Spectacular Spider-Man #214 (1994) – The awesomeness of Ninja Spider-Man debuts here. Spider-Man #25 (1992) – The first appearance of Spider-Phoenix. Amazing Spider-Man #410 (1996) – Spider-Carnage debuts here. Amazing Spider-Man #367 (1992) – Blood Spider first appearance. Amazing Spider-Man #258 (1984) – Not only an early symbiote appearance, but the first appearance of……..bag head Spidey!! No really, no kidding. Spider-Man #58 (1995) – Leather Jacket Spider-Man! Spider-Man 2099 #29 (1995) – First appearance of Flipside. Spider-Girl #5 (1999) – Spider-Venom‘s first appearance. Amazing Spider-Man #682 (2012) – Spider-Amour III debuts. Amazing Spider-Man #656 (2011) – Spider-Amour II! Spectacular Spider-Man #256 (1998) – Another version of the Grocery bag head Spidey! Spider-Man Noir #1 (2009) – First appearance of Spider-Man Noir. Amazing Spider-Man #650 (2011) – Spider-Man Stealth! Amazing Spider-Man #569 (2008) – First appearance of Anti-Venom. Amazing Spider-Man #300 (1988) – First FULL Venom appearance. Ultimate Fallout #4 (2011) – First Miles Morales as Spidey. Marvel Tails Starring Peter Porker, The Spectacular Spider-Ham #1 (1983) – The first appearance of the very awesome Spider-Ham! Now how about the girls? Yes, over the years there have been variations of Spidey on the female side. The same rules apply here as above, some spider-like villains included. Let’s have a look at them. Marvel Spotlight #32 (1977) – First appearance of Spider-Woman. What If? Starring Spider-Man Vol2 #105 (1989) – First appearance of Spider-Girl (May Parker). Ultimate Spider-Man #98 (2006) – First Jessica Drew as Spider-Woman. Death’s Head II #4 (1992) – Death’s Head Spidey. Amazing Spider-Man #210 (1980) – First Madame Web. Amazing Fantasy Vol. 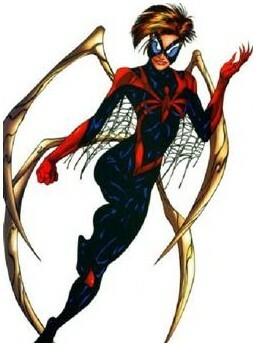 2 #1 (2004) – Ana Sofia Corazon as Spider-Girl. Carnage #1 (2010) – First appearance of Scorn. The Spectacular Spider-Man #263 (1998) – Martha Franklin as Spider-Woman. Venom: Lethal Protector #4 (1993) – First appearance of Scream. Amazing Spider-Man #375 (1993) – First appearance of She-Venom. Venom #38 (2013) – The debut of Mania. Spider-Girl #45 (2002) – Felicity Hardy as Scarlet Spider. Amazing Spider-Girl #14 (2008) – First appearance of Arana. Amazing Spider-Girl #20 (2008) – Debut of Mayhem (April Parker). Awesome list thanks! You got Amazing Spiderman 411 as Spider Carnage 1st, but just a typo probably as it was 410 that was the first. What about Spider-Ham 15.88? Spoof of Spider-Man 2099 (15.88 is because he’s been discounted).